Offering tandem bicycle rides to the visually impaired in and around Cheltenham. with his arms raised and grinning. Hi, my name is John. I'm 43, living in Cheltenham now, and I'm a pilot for Tandemonium; I'm also its co-founder (with our chair, Ed), and treasurer. My dad loves to tell the story of two-year-old me and my tricycle, on hot summer days in Toronto, Canada: pretty much every day, we'd make the trip to the local ice cream shop, which would take me a good 20 to 30 minutes of pedalling each way, as Dad tells it. I never flagged, visions of what we call French Mint dancing in my head. Later, I recall a birthday. (I don't remember how old I was, but I know my bike at the time had had training wheels on it in the recent past.) I remember opening all my presents and then my dad saying, "There's one more..." and leading me down to our pantry. I opened the door and there was a brand new shiny, proper big-boy bike, with banana seat, coaster brakes, long hog-style handlebars, and, the pièce de résistance, a stylised fireball all down the chain guard. Life doesn't get better. I've never really considered myself a cyclist. But being able to get from A to B on a bicycle has been an assumption all my life, and, particularly since moving to Cheltenham, is something I really enjoy. It was only after I started volunteering for a number of charities for the visually impaired, that I started to question many of the assumptions in my life, including my hopping on a bike without a second thought. It was the combination of hearing Meg and Ed's sadness at having to return their tandem bike to Charlotte's Tandems -- that's how that great charity is able to help so many VI people, and we certainly don't begrudge them that! -- seeing Jayne's happiness at riding the one we were able to borrow from that same charity, and Ines telling me how much she missed the tandem holidays of her youth that got me thinking: why can't we make this happen? With a few tandem bikes, these folks, and other VI people in and around Cheltenham, could enjoy regular days out, with the wind in their hair. You can read the earlier installments of Tandemonium Tales on our Facebook page. Sponsored Cycling Challenge A Big Success! 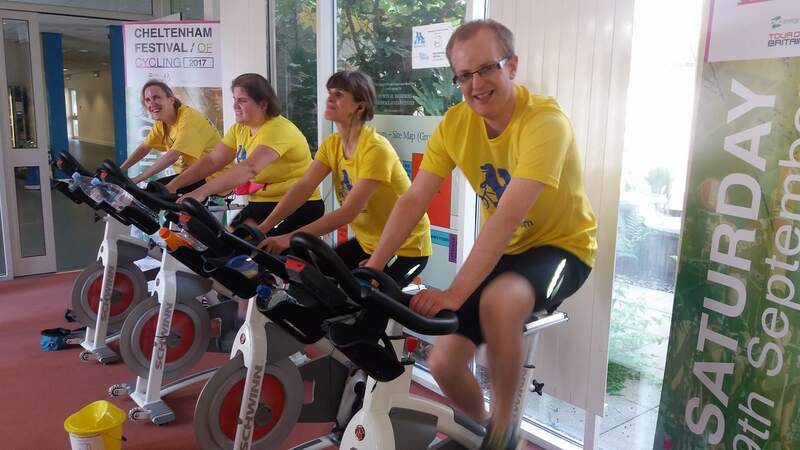 On 17 June, Team Tandemonium took to spin bikes to raise funds for our tandem biking community group for the visually impaired of Cheltenham. The five-person team planned to cycle the equivalent of four lengths of the penultimate leg of this year's Tour of Britain -- which will arrive in Cheltenham this September -- that is, four lots of 92 miles. Equipment problems began in the first hour, and, by the fourth, it was clear that we couldn't reliably calculate the distance we were covering on the bikes. The team made the difficult decision to cycle for the five hours (plus any break times) that it had taken them to cycle their planned distance in training; they felt that this was a reasonable compromise in trying circumstances. Spurred on by family, friends, and the curious folk of Cheltenham, the team called time on their challenge at just under six hours. We are overjoyed -- overwhelmed, really -- to announce that, thanks to your very generous donations, the team beat their fundraising goal for Tandemonium! (The Just Giving page is still up, for anyone who intended to donate, but hasn't had the chance yet.) And we really do want to thank you all, whether you donated off- or on-line, or dropped a bit in our buckets on the day: your generosity will bring a lot of joy to the visually impaired of Cheltenham, who'll soon be able to feel the wind in their hair on the back of a tandem bike! We'd also like to thank our partner, The Cheltenham Trust, for the use of their Leisure @ Cheltenham facility and the support of their staff. We look forward to doing more good works, as the Cheltenham Festival of Cycling ramps up, and beyond. We'd also like to thank everyone who came out to see us on the day; together with the unfailing good humour of our MC, Gav Higgins, you all made for a great atmosphere that really helped us push through. Finally, we'd like to thank Angela Gilbert, of the GRCC, and Chris Chapman, of the Tewkesbury VIPs, for their advice and support in the early days of this project -- we wouldn't be here without you! If you'd like to get involved in our community group, either as a sighted cyclist, a visually-impaired 'stoker' (on the back), or in some other capacity, please do get in touch! Our email address is tandemonium.bikes@gmail.com, or check out our Contact Us page for social media links. Sponsor Meg to Cycle 92 Miles! My name is Meg and I’ve been registered blind since birth. I’m helping to set up the Tandemonium group in Cheltenham because I think tandems are fantastic for people who don’t have enough sight to ride a standard bike. There have been a fair few tandems scattered throughout my life. I was lucky enough to grow up in the countryside where I rode scooters and bikes with stabilisers in the wide green spaces of the Yorkshire Dales. My parents bought a Tag Along bike so that I could accompany my family on rides. I loved our trips to Center Parcs and one year, we loaded all our bikes onto a roof rack and headed for France. I have good memories of those cycling trips, even though my parents complained that I wasn’t pedalling and made them do all the work! More recently, I have taken part in inclusive cycling trips. These usually involved riding an adapted bike rather than the tandems I was used to. I once rode a ‘Chuckle Brothers’ bike’ with the seats side by side and on one occasion, I rode a reversed tandem. This meant that I was at the front of the bike for a change and that my pilot had to steer from the back. Last year, my boyfriend and I borrowed a tandem from the charity Charlotte’s Tandems. They are a wonderful Dursley-based organisation who recognise the need for people who can’t ride a normal bike to experience the freedom of cycling. I’m really excited about Tandemonium. Tandems enable people with a visual impairment to get out and about, stay active, and to meet new people. I’m looking forward to working with our sighted pilots – otherwise known as the navigators on the front! Our group will enable people who enjoy cycling to come together for regular rides. I can’t wait to get back on a bike! Meg is studying for a Masters degree and loves reading and writing. "I have really enjoyed training for the sponsored cycle," she says. "It's given me an excuse to eat lots of sugary things and all the cycling has done wonders for my sleeping pattern!" Sponsor Ed to Cycle 92 Miles! My name is Ed, I am the Chair of Tandemonium. I am 31 and live in Cheltenham. My optic nerves were damaged by a brain tumour 8 years ago. I am missing much of my visual field, but fortunately still have a narrow tunnel of good sight. I experienced the usual ups and downs of learning to ride a bike as a child. During one lesson with my Dad, I was worried about losing control and going down the hill just past our house. Dad reassured me by saying I could use our gravel drive as my emergency stopping area. So, I set off on my stabilisers, and saw a woman on the road ahead. She tried to get out of my way, by stepping on to my emergency stopping area! I soon found myself rattling down the hill, with Dad in hot pursuit. I ended up flying over the handlebars, the lesson ending with a few grazes and a fair bit of crying. Despite this, I loved going on rides throughout the rest of my childhood. I was involved in a variety of sports before I lost part of my sight; I particularly enjoyed football, badminton and cricket. As I was coming to terms with being partially sighted, I felt frustrated that I could no longer take part in these activities. This changed in 2012, when I attended a taster session run by Blind Cricket England and Wales. This brought me into contact with other visually impaired people for the first time and was a real turning point for me. Shortly afterwards, I co-founded the Gloucestershire Growlers Visually Impaired Cricket Club. The friends I made and the things I learnt eventually enabled me to get back to work and live independently again. Seeing the positive impact resulting from the success of the team inspired me to found Tandemonium, to benefit the local visually impaired community. A few years ago, my girlfriend and I borrowed a bike from a charity called Charlotte’s Tandems. I really enjoyed riding it up and down the Honeybourne Line in Cheltenham. I would love to do more, but my partial sight makes it unsafe for me to ride on the road. As a result, I am really excited about the prospect of hitting the roads of Gloucestershire with Tandemonium, feeling the wind in what’s left of my hair and perhaps stopping at a few pubs along the way! On Saturday, 17 June, I will be cycling 92 miles on a spin bike to raise money for Tandemonium. This will help us buy a small fleet of tandems and get the project started. It will be the biggest physical challenge of my life and I’m putting my body on the line so that visually impaired people in Gloucestershire can enjoy cycling in the way that so many sighted people do. You can sponsor me on our fundraising page below. 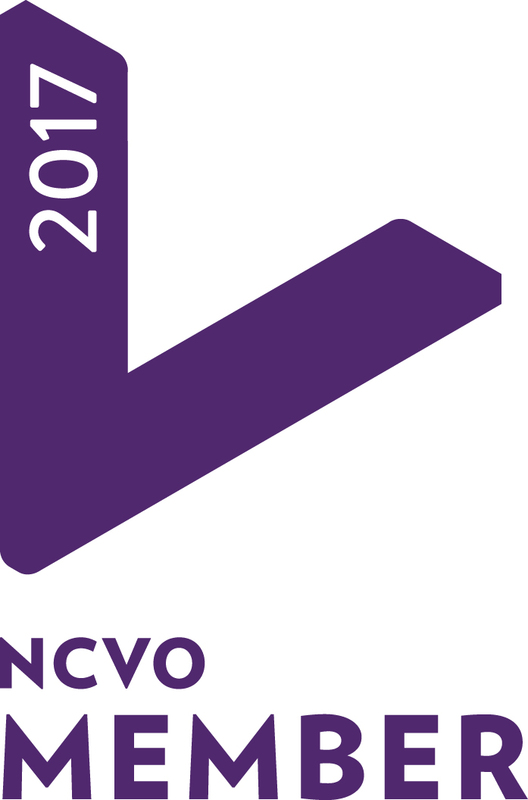 Sponsor Rob and Jayne to Cycle 92 Miles! "Sport is my life and I love new challenges!" Jayne is also an amazing athlete with many 10Ks and 7 half marathons under her belt! She enjoys taking part in duathlons where she can combine her loves of running and cycling. This would have been impossible for her without access to a tandem and the kindness of a guide runner and a pilot to ride on the front of the bike. When not running, she loves going on adventures with her guide dog. "Being on a tandem allows me to get out in the fresh air. I love going really fast and feeling free. It also gives me the chance to meet up with friends and hopefully make new ones." Sponsor Ines to Cycle 92 Miles! My name is Ines and I am 30 years old. I'm originally from Germany but now living in Cheltenham. I am registered blind with only a little bit of residual site due to my optic nerve not properly developing at birth. When I was growing up, my family was very ambitious, especially when it came to sports and activities. there was pretty much nothing they weren’t involved in. Having me, a blind child, may have given them several challenges, but they refused to wrap me in cotton wool and made sure I tried everything at least once. So too with tandem biking, which quickly became my favourite activity. My parents always took us on day trips with the bike, and when I was 7 or 8, I started to use a tandem with my dad. Sometimes we rode as many as 60 KM in one day! Then, in 2000, when I was 13, we embarked on a 4 day long trip on the bike along the river Rhein, from Heidelberg to Koblenz, staying in youth hostels along the way. Cycling about 60 KM per day, sometimes in quite hot weather, was a challenge, however I loved it so much that we did it again, along a different river ,the year after. Even in boarding school I pursued this activity, as it was still my favourite sport. It has now been more than 10 years since I last rode a tandem bike and I absolutely miss it. As with many outdoor activities, a sighted person is needed for me to enjoy this activity. Having moved to the UK meant that I do not have my family at my disposal anymore. This is why I am so excited about the Tandemonium project. It would be a dream come true for me to cycle regularly again. Indoor cycling in the gym may be something we can do independently, but it does not give the same satisfaction, and of course you don't get the benefit of the fresh air. Ines grew up in Germany but came to Cheltenham when she fell in love with a Cheltonian online. They have now been happily married for several years. She attends a walking group and loves a spot of retail therapy. Ines likes going to new places and regularly travels around with her husband. "It would be a dream come true for me to cycle regularly again." We have been working hard over the past six months to ensure that our dream of a tandem group for visually impaired people becomes a reality. After lots of discussions, a sprinkling of meetings and lots of healthy debate, Tandemonium is almost ready to call itself open for business. However, there is still one obstacle to the project's success: money. Tandemonium currently has no money and without funds, it's difficult to get started. The team put their heads together and decided that it was time we did a spot of fundraising. We approached Leisure@ in Cheltenham and were fortunate enough to be offered the support of the Cheltenham Trust. With their instrumental support, our fundraising venture was born. On Saturday 17 June, we will be cycling the distance of this year's penultimate leg of the Tour of Britain which is from Hemel Hempstead to Cheltenham. This means that we will be cycling 92 miles on spin bikes at Leisure@ in Cheltenham. The money raised will go towards funding a small fleet of tandems and buying the other essentials to getting our project up and running. Ed, Meg, Ines, Rob and Jayne have been training hard and are hoping to do this in under 5 hours. Anything you can do to promote our fundraiser would be great. Whether you share our fundraising page, spare a few pennies for the cause, volunteer to come and support us on the day or spread the word about our project, you're helping to ensure that people with limited vision can enjoy the freedom of cycling.